posted on February 21, 2014 by Piers Higgs | Comments Off on Welcome to Dolphin Watch! Last night, Aaron, AJ an I attended the launch of the new Dolphin Watch App, which is the second App we have produced under our Citizen Science Hub project with Murdoch University. The App was launched by Professor Lyn Beazley, who has now launched four of our projects, and has been a great champion of citizen science and science in general here in Western Australia. The Swan River Trust team put out a lot of media about it yesterday, including a news item on Channel Ten news, radio grabs on 6PR and there are articles around on the web this morning – you can read the official media release on the Swan River Trust site here. The launch was a culmination of a lot of work over the last few months by the team here at Gaia Resources. We have been working with Swan River Trust and Murdoch staff and researchers to provide this new App, and it has been a great project with amazing engagement from the staff involved, and the volunteers, too. The dedicated Dolphin Watch volunteers to help us test the App – over 30 volunteers were involved, which resulted in almost 200 surveys and a further 200 ‘sightings’ in the testing period. It will be very interesting to see how our records change over the coming months as the Dolphin Watch volunteers start submitting their sightings! 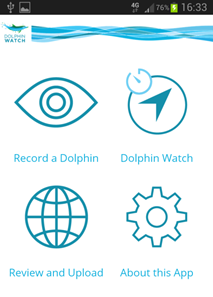 The new App differs from the Coastal Walkabout one as you can only record sightings of Bottlenose Dolphins in the Dolphin Watch app, whereas in Coastal Walkabout you can record Marine Mammals, Fish, Reptiles, Sea Birds and other species as well. The other difference is that you can undertake a “Dolphin Watch” in the Dolphin Watch App – meaning a timed survey that is then contributed to the research that is underway by Murdoch University. 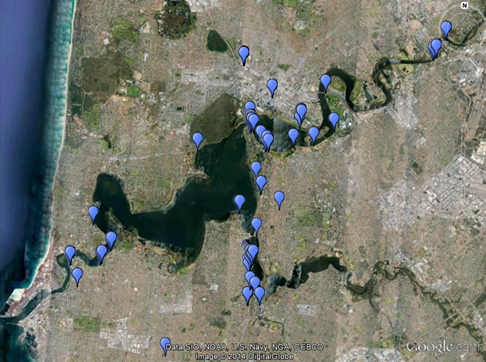 This Dolphin Watch function is only available to people that have a Dolphin Watch ID number – which you can only get through training with the Swan River Trust (and their systems check this ID number for each data point… so don’t fake one). I’ll be going to the training session in March to get formally trained myself. At the time I pressed “Publish” on this post, the Android version is available in the Google Play store, and the iPhone version is sitting somewhere in the iTunes system waiting for them to run the automated review processes… one of the traps for App development! Through the Coastal Walkabout web site, you can watch the records flow in across all the Apps by going to the Data page (here). This summarises all the sightings and tracks from all of the Coastal Walkabout and related surveys, including those from both the Dolphin Watch App and the Coastal Walkabout App. You can also see the records just for the Dolphin Watch page as they emerge on the specific Dolphin Watch project page (here). We have a range of other Apps under the marine Coastal Walkabout banner coming up in the near future… and not just marine ones! Leave a comment below, or start a conversation on Twitter or Facebook with our team!